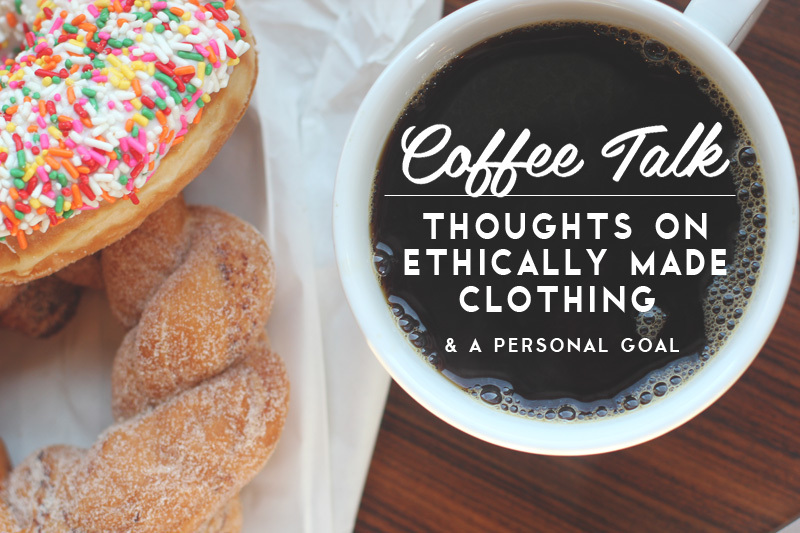 This past year, the past few months specifically, I've been thinking a lot about ethically produced clothing. More and more it's bothered me that some of the clothes I enjoy are produced in ways that are hurtful to other people on this planet. We're so separated from actually having to see the people who make our clothes that it's hard to feel like that clothing is produced in a hurtful way. I mean, walking into a Forever 21 isn't the same as walking into a sweatshop. It's all shiny and there's pop music and miles of clothing racks full of cute things. Cute, dirt cheap things. So cheap it almost feels like you're stealing something. I got a pair of high waisted shorts there once (on sale) for $3.50. It's craziness. But anyway, I'm not just talking about Forever 21, it's most of our clothes these days. The clothing industry has made the shift to quick and dirty fashion. We want new styles every few weeks (or every week, for some), and we can get them at the mall, or Target, etc. Instead of choosing items that are high quality and items that we value enough to mend when they start to show wear, we'll go for items that are low quality because we know that we'll probably only wear them for a couple seasons at the most, and then that item will become boring, or be shoved to the back of our closet to make room for the new, trendy, cheap things we've acquired. I honestly don't see this new style of instant-gratification-shopping stopping. I for one do enjoy infusing my closet with new items on a semi-regular basis, though I do prefer to do it with items that I know I'll be able to remix and wear through different seasons. But, while I realize that this trend of fast fashion is a train that could be unstoppable at this point, I'd like make an effort not to contribute to the part of that train that hurts the people who make my clothes. I've decided that one of my 26 before 27 goals will be to try and only purchase clothing that I know is ethically produced/fair trade/made in the USA, or thrifted/vintage. This is going to make trips to Target significantly more painful, though in the past I think they've done some of their designer collaborations where the designer specified that the clothes needed to be produced ethically (fingers crossed they do another one of those!). There's a lot of instant gratification in the way we shop these days. It's hard to save up for a more expensive item these days because there's no guarantee that the item will even still be in stock when you finally have the funds saved up. I've definitely had that happen before and it's so disappointing. But things move so quickly through stores nowadays that you almost always have to impulse buy, or miss out on that item. So we always get that awesome feeling of instant gratification, and we can justify it because we can tell ourselves that it'd probably be sold out of our size the next time we went to the store. Another problem that has arisen from cheaply made clothes is just that... they're inexpensive. This isn't necessarily a problem (right? isn't finding cute clothes for low prices a good thing?) but now we have our price radar calibrated in a way that makes us forget that how the item was produced factors into that price. Seventy bucks for a dress would be outrageously expensive if you bought it at Forever 21 or Target, but seventy for a well made dress out of quality materials that was produced by people who were paid a decent wage? I understand that there are a lot of people out there that can't afford a $70 dress, and that the cheap fashion houses have been able to provide super cute items for super cheap prices. I remember when we first got a Forever 21 up in Anchorage a few years ago and I was kind of mind blown about how inexpensive everything is. But now I'm wondering if cheap prices are worth the unethical methods used to produce clothing so inexpensively. Is that enough justification? My gut reaction is, "no." 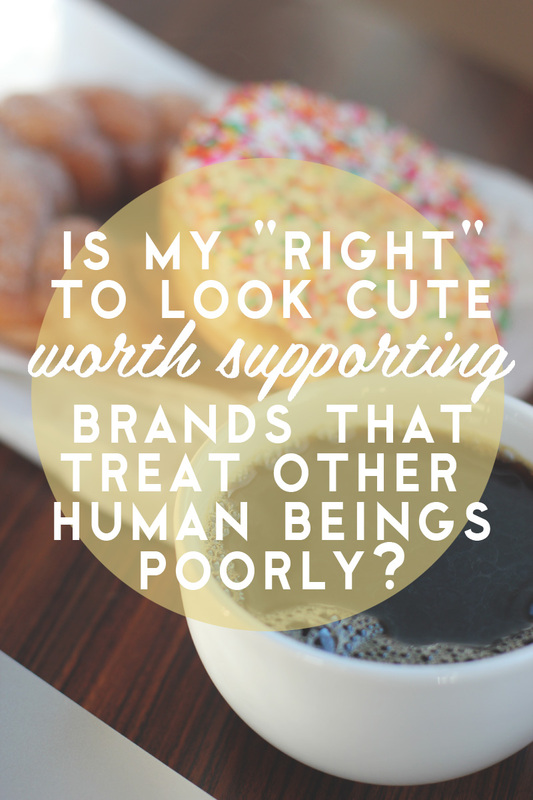 Is my "right" to look cute worth supporting brands that treat other human beings poorly? As a style blogger I realize that I have some (very small) measure of power over what people choose to purchase. I know that people see items on my blog, want them, and go buy them. I definitely do that with the blogs I read! So, I feel even more convicted, in that aspect, to choose to show you guys items that are produced in an ethical way. I'm certainly not an expert on finding out the sources of how a brand produces its clothing, so there will definitely be a big learning curve when it comes to figuring this all out. I emailed Susan from ModCloth and asked her if she had some resources, and she shared a couple with me, as well as some of the categories of ModCloth that have eco-friendly, or Made in the USA clothing. If you guys know of any good resources for finding out how a brand produces their clothing, I'd love if you'd share those! Jumping into this world is kind of crazy. There are so many aspects to ethically produced clothing. Was the fabric produced ethically? Or was it just the production of the garment that was fair trade? Etc. Etc. There's a lot I don't know, but I want to learn more. I know there are tons of people out there who know way more about this issue than I do. I'll still be wearing the items I already own, since I feel like it would just be wasteful to get rid of things I already have. I receive some of my clothing from sponsors, so I'll try very hard to find items that my sponsors offer that are ethical. I believe Dear Creatures is ethically made in China, which is nice since I'm a big fan of their styles. I recently got a dress from ModCloth by Bibico, which is the first thing I've gotten with the specific intention of finding something ethically produced, and I've heard that ModCloth plans on stocking some more brands who produce their clothing ethically, which is good news! I've also recently learned of Mata Traders, which is a shop that sells fair trade items. I'm also a big fan of businesses like Krochet Kids and Musana Jewelry, who directly help support women around the world If you guys know of more shops that make it easy to find fair trade clothing, or directly support the artisans, please let me know! I suppose this could all sound pretentious. But I really have been convicted of late about this issue. I feel like as a society we're incredibly wasteful in general, and I want to start working against that in my own personal life. Perhaps ultimately it won't matter, but at least I'm trying to throw a few starfish back into the water, and it matters to those starfish, even if I can't throw all the starfish back (you guys know the starfish analogy, right?). I hope to be able to do a more thorough post about this issue once I'm further along in my "quest". If you guys have any good resources or books to share that you've read about the issue, please let me know about them! While I believe that this goal is something that I could accomplish without necessarily needing to know a ton, I do want to be more knowledgable about the topic.